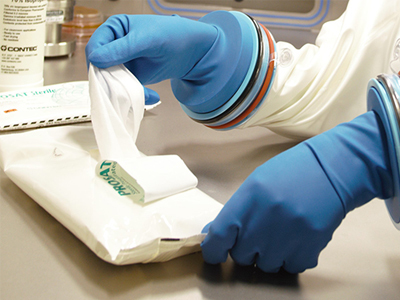 In every cleanroom contamination is permanently being generated by personnel and equipment. Such contamination will subsequently either be filtered out of the air (airborne particles) or settle on surfaces. These contaminated surfaces must then be cleaned regularly (floors usually daily) by means of wiping or mopping. 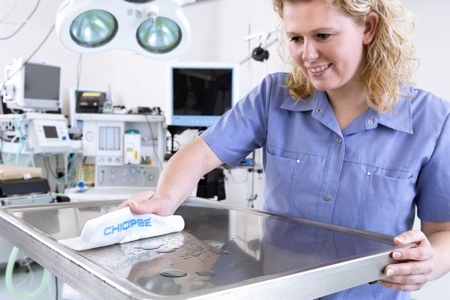 Contamination and minute, invisible particles can be reliably removed from surfaces only with the manual process of wiping with special mops. The process of cleaning therefore has a direct effect on the cleanliness and thus on the status of the cleanroom. 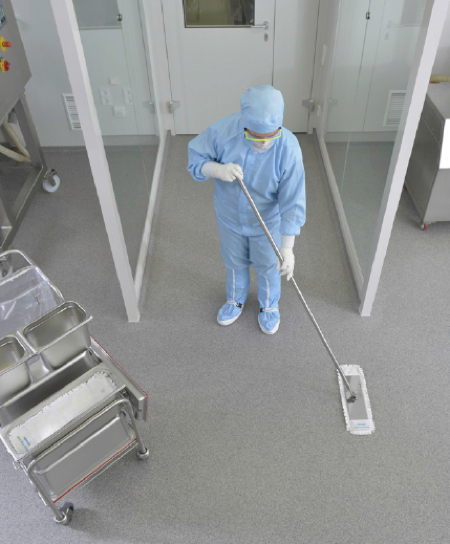 However, cleanroom cleaning is often regarded as time-consuming, inconvenient or troublesome, which is understandable if outdated techniques or equipment are being utilised. 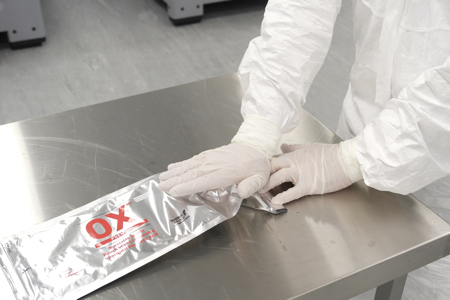 There are no short cuts to a cleaned cleanroom as this process needs to be carried out very carefully and precisely and internal SOPs need to be complied with. Hydroflex has developed a mopping system that, it believes, can revolutionise many aspects of cleanroom cleaning. Time requirement: Time is directly linked to costs – particularly where cleanroom operators and users are primarily responsible for the production of their products. Because manual cleaning usually takes place at the end of each working day/production process and often no additional staff are provided for this purpose, the process needs to be carried out as efficiently as possible, while at the same time ensuring that the quality is not reduced. Exertion: The greatest source of contamination in any cleanroom is human. 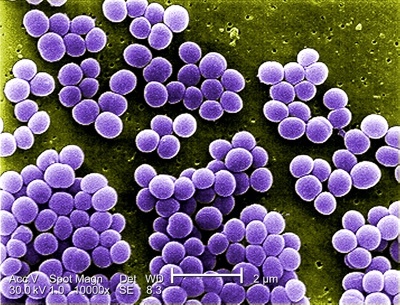 At every movement humans release vast amounts of particles and germs from the surface of the skin into the environment. Thus all movements in the controlled environment need to be reduced to a minimum. However, during the cleaning procedure, mechanical processes need to be carried out that require exertion by the user. Cleaning processes that involve a large amount of effort result in more particle generation and can lead to demotivation in operators and result in user error. User error: Strict adherence to the operating procedures and instructions validated internally by the company is essential for an effective cleaning process. Incorrect procedures or incorrect handling of the mop or trolley system can quickly lead to an insufficiently wetted floor or to ineffective cleaning. This often means that a safe disinfection is not achieved. To avoid this kind of incorrect use the user needs to be trained and the cleaning process designed to be as simple as possible without potential sources of error. Reproducibility: The effectiveness of the cleaning process must be tested and validated before a new cleaning system can be implemented. The efficiency of the cleaning and disinfection needs to be monitored regularly, even if a system has already been in use for a long time. 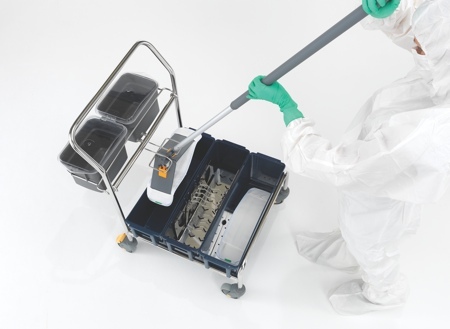 All work steps and components of the cleaning system need to be designed to be as reproducible as possible to ensure that the cleaning process can be validated. If there are variables, for example in the process of wetting the mop, then it can no longer be guaranteed that the disinfection is equally effective in each process. Cross-contamination: The mop head is the central part of every mopping system as it both distributes previously absorbed liquid on a surface as well as picks up and retains tiny particles by means of its material structure and fine microfibres. These particles, which are usually microbially contaminated, must be removed to prevent further bacterial growth or transmission by people and equipment. 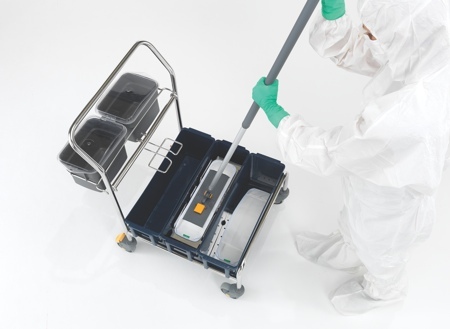 As the mop is contaminated with bacteria after the wiping process, it must be moved out of the cleanroom without coming into further contact with the fresh liquid, the equipment or the user. 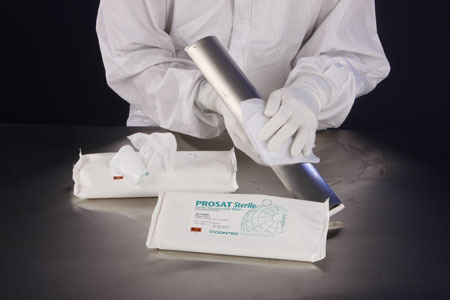 Only in this way can cross-contamination be prevented. Suitability: Equipment that is brought into the cleanroom must be compatible with the relevant cleanroom class in accordance with applicable regulations such as GMP and ISO 14644. This ensures safety through compliance. 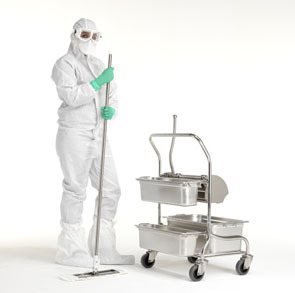 According to these regulations, customary or industrial versions of cleaning equipment should not be used in cleanroom areas. 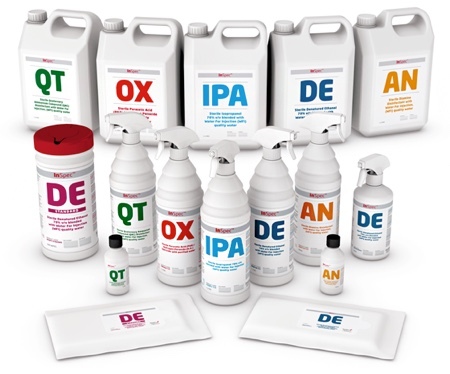 Cleaning equipment should be robust, abrasion-free and easy to clean and also needs to withstand the process of disinfection and sterilisation (GMP areas). Complicated structures with cracks and hard-to-clean areas should be avoided. The system allows all steps (mop pick-up, mop wetting, mop discarding) to be performed without hand contact. With this principle it is possible to carry out cleaning processes substantially quicker, as neither set-up time (e.g. mop box systems) nor several wetting steps (e.g. press systems) are necessary. Each mop can be attached and wetted in just a few seconds. Also, as only the exactly required number of mops are wetted, excess is avoided. 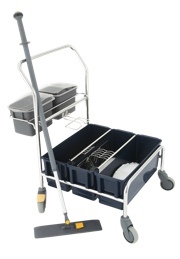 The handling of boxes or the strenuous wringing of wet mops is no longer required. Mop wetting is performed in a single easy step, thereby reducing user exertion to a minimum. The logical set-up of the three-step system minimises the possibility of user error. As the process is simple and uncomplicated, it is easy to learn and repeat. The special mop wetting device is at the core of the system. It applies the same amount of liquid out of the bucket onto the mop at every activation and thus guarantees an exact wetting level and absolute reproducibility. As a touchless system, this method not only completely prevents hand contact with the mop but also with the mop frame and buckets. Cross contamination is thus prevented. 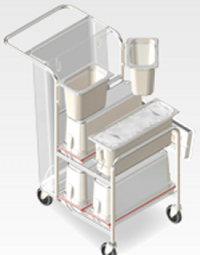 The mopping system has an electropolished stainless steel frame and robust plastic buckets, while the components can be dismantled, are easy to clean and completely autoclavable. Light components were also selected to improve the ergonomics. 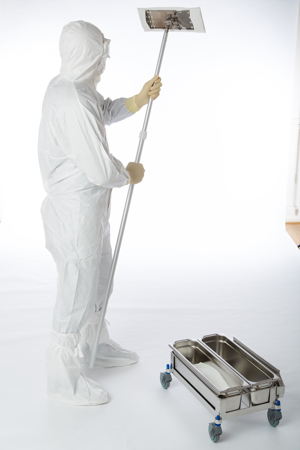 Cleanroom cleaning is a process that always demands time and precise execution. With the correct equipment it is, however, possible to achieve significant savings in time and effort without restricting safety and efficiency.